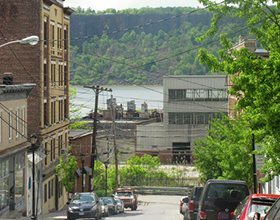 The town where Family-to-Family started, and the home of Family-to-Family founder Pam Koner is a small village of 8,000 people located alongside the Hudson River in New York. While much of Hastings is a well-to-do bedroom suburb of Manhattan, there are pockets of poverty here, and the economic downturn and job losses have drastically affected families that were previously managing to just scrape by. When Pam Koner learned from community leaders that these families needed help, she reached out to other F-to-F Hastings families, who quickly pitched in to shop for and pack monthly food boxes. Unlike in the other communities served by F-to-F, in Hastings the names of both the donors and the families in need are kept anonymous, since it’s a small town and people are likely to know each other. Each family in need is identified only by an alphabet letter. So, for example, a food box labeled for “Family G” is delivered to the town recreation center each month, where the recipient family can pick it up in privacy. And although we keep it anonymous, families are still finding a way to communicate… by sending notes back and forth with no names. In Hastings-on-Hudson, Family-to-Family partners with local residents of the community to provide groceries for our sponsored families. Volunteer shoppers provide groceries and gift cards each month.